Here are a couple of shots of my Barn House Booth. I had such a blast working with Joe and Jermonne, their beautiful home, wonderful vendors and customers. This was the entrance into my booth. 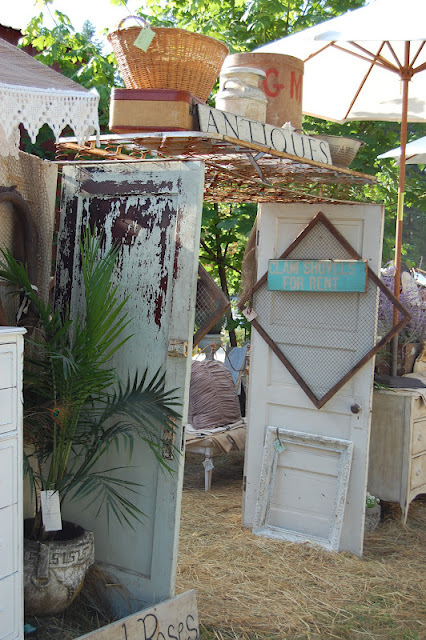 Dont forget to visit downtown Camas this Saturday at 9am for the downtown vintage street faire. 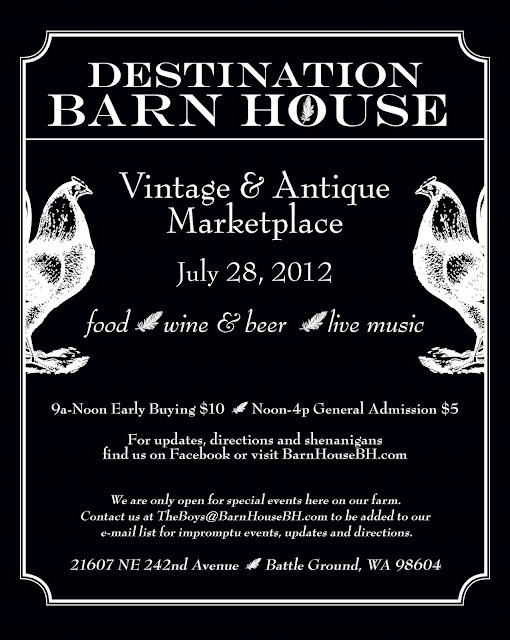 There will be amazing displays, great finds and tasty treats. Yep, that's right....Its Barn House Baby!!! Getting ready for show time. 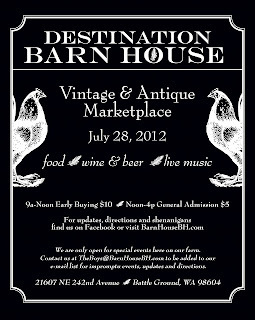 This Saturday, July 28th, details below...you wont want to miss it. I am very honored to be an invited guest for the third year in a row!!! Here is a sneak peak of a fabulous french chair I had reupholstered. I love the way it turned out...Why cant I just keep it???? Wear your best junkin clothes, comfiest junkin shoes, and bring your truck....It's going to be a FAB party! I have already started stashing away all my best JUNK for the upcoming Barn House extravaganza!!! You wont want to miss it!!! 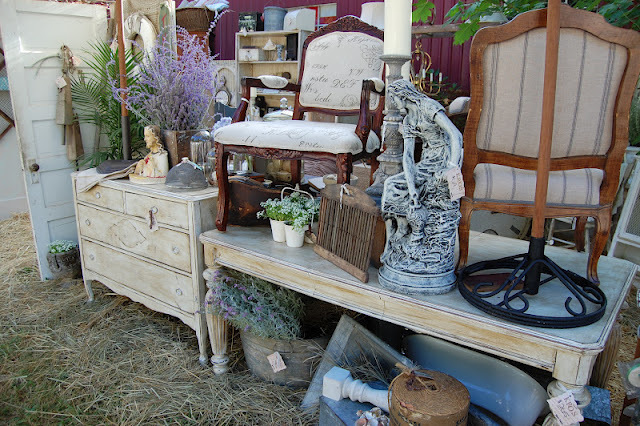 It's a Birthday Bash at Camas Antiques. Old chicken feed and primitive table to die for. And to add to all the excitement...guess who's in the house??? Sunday Mike and I went into the shop and did some updating....trust me, it was high time!!! 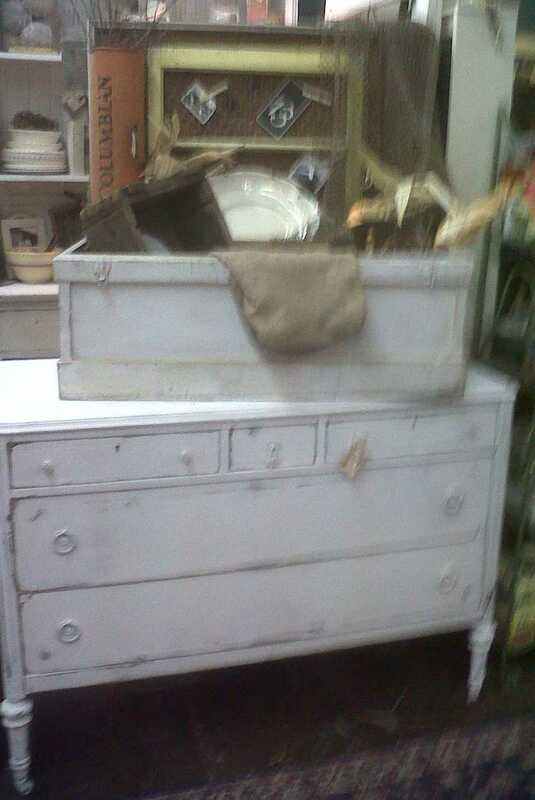 Love this sweet dresser with matching mirror! Sidney will be starting drivers ed here in the next couple of weeks. She is feeling great and her hair is growing like crazy...and thick too! I have been very busy selling lots of furniture at my spot in Camas....It is flying out the door. Here are some updated photos of my booth! Hope you all had a safe and wonderful New Years!!! It's been awhile since I have posted so I thought I would be a good blogger and give you some updates on what's new. Sunday I moved out of up my booth space at Monticello. I felt like I just couldn't give it the attention that it deserved with our family happenings, work and the shop being in Portland. I will really miss my Monticello family and appreciate all that they have done for us!!! 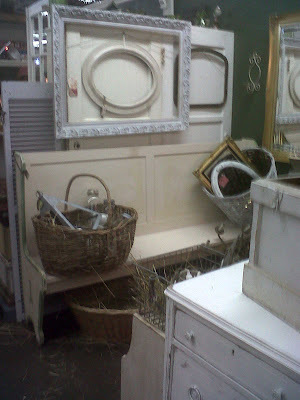 Mid November I did however take a space at Camas Antiques!!! 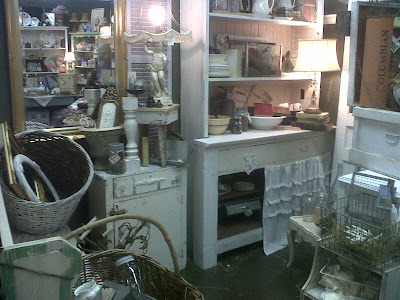 Being that it is 5 minutes from my house, I have help from family when needed, and I really didn't want to give up junkin...It felt so right!!! Here are some pics of my booth. Lots has sold...so it looks a little different now. We go in on Monday to meet with the radiation oncologist to discuss radiation. This was very scary to us at first...we were really hoping to bypass radiation if her tumors shrunk enough. One did but the other one just not enough. So we have elected to do radiation and just be done with it....The good thing is they say she wont have any side effects from it and will continue growing hair :0 which is a good thing. Hope you all had a wonderful Thanksgiving...There was so much to be thankful for! 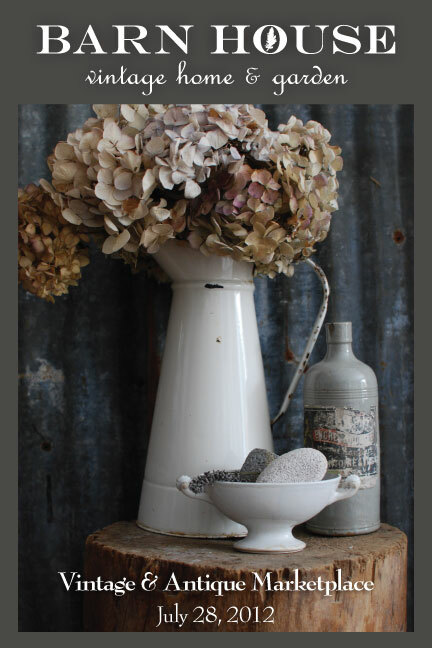 Mark your calendar for this Friday and Saturday....The long anticipated Crafts Unlimited Holiday Boutique featuring wonderful handmade gifts, vintage treasures as well as antiques. Labels: crafts unlimited holiday boutique, Kindred Roses, kindred spirit soap co. Here is my most recent piece that I have finished. 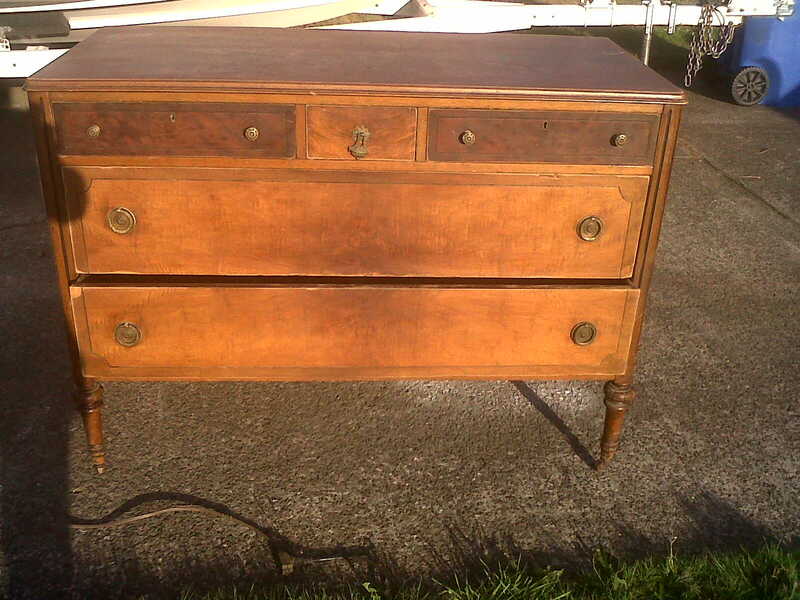 Amazing what a little white paint and a sander will do. She is starting to loose her hair :( That is the most emotional part for her..and me. We are lucky that she has not had any nausea or flu like symptoms. Most of her side effects are from her high dose of steroids. Thank you all for your prayers and I will keep you all updated!! I also want to thank my Monticello family for all your donations, words of kindness, love, prayers and support!